Professional Coin Grading Service will again offer a special opportunity for its popular "crossover" service at the February 4 – 6, 2016 Long Beach Coin, Currency, Stamp & Sports Collectible Expo. The usual crossover grading fee will be reduced to only $10 on coins submitted at the show that do not qualify to be placed into PCGS holders. “The best coins always end up in PCGS holders,” states PCGS President Don Willis. 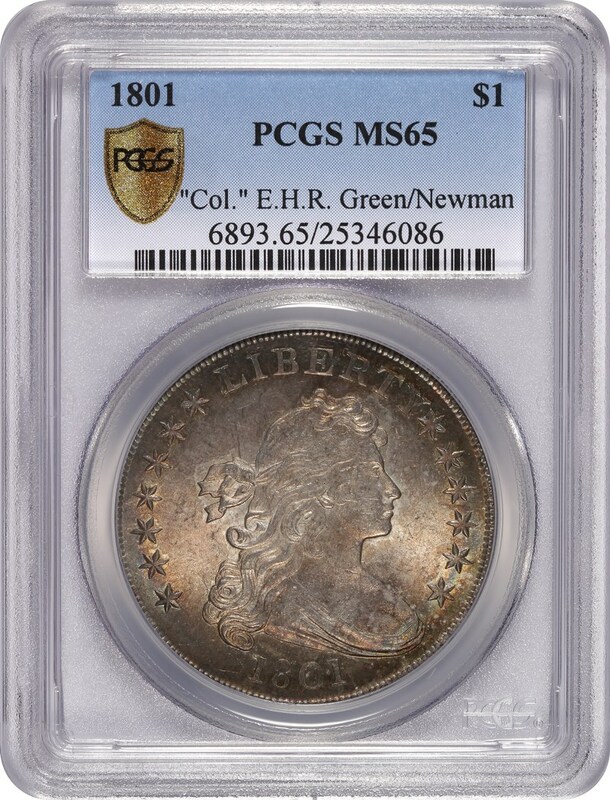 This 1801 Draped Bust dollar from the Newman Collection crossed over to become PCGS Secure MS65. “The best coins always end up in PCGS holders because collectors and dealers know that PCGS certification helps maximize the value, liquidity and security of coins," stated PCGS President Don Willis. “As 2015 auction results demonstrate, coins in PCGS holders repeatedly brought the highest prices. The February Long Beach Expo is an excellent opportunity to submit your coins that have been graded by other third-party grading companies. If the coins do not meet PCGS standards and are not crossed over, you only pay $10 in grading fees," explained Willis. PCGS will accept coins in ANACS, ICG or NGC holders. Each customer can submit a maximum of 600 crossovers. The Crossover Special is not available for Show Express orders. For coins that cross, you will be charged the regular grading fee and handling fee, along with the Guarantee Premium, which is equal to 1% of the value of the coin in its final grade ($5 minimum Guaranteed Premium). Any coin that does not cross will be returned in its original holder and you will only be charged $10 per coin, and a handling fee of $10 per order. Coins received by PCGS after 6:00 p.m. Thursday, February 4, may not be completed by the end of the show. Please check with a PCGS Customer Service Representative at the booth (#807) for official cutoff information. Any submissions not completed at the show are subject to appropriate shipping and handling charges which are in addition to any grading or guarantee premium fees. PCGS recommends a credit card as method of payment to ensure overpayment is avoided. For additional information about the February 2016 Long Beach Expo Crossover special offer, contact PCGS Customer Service representatives at the PCGS booth during the Long Beach Expo or call (800) 447-8848.